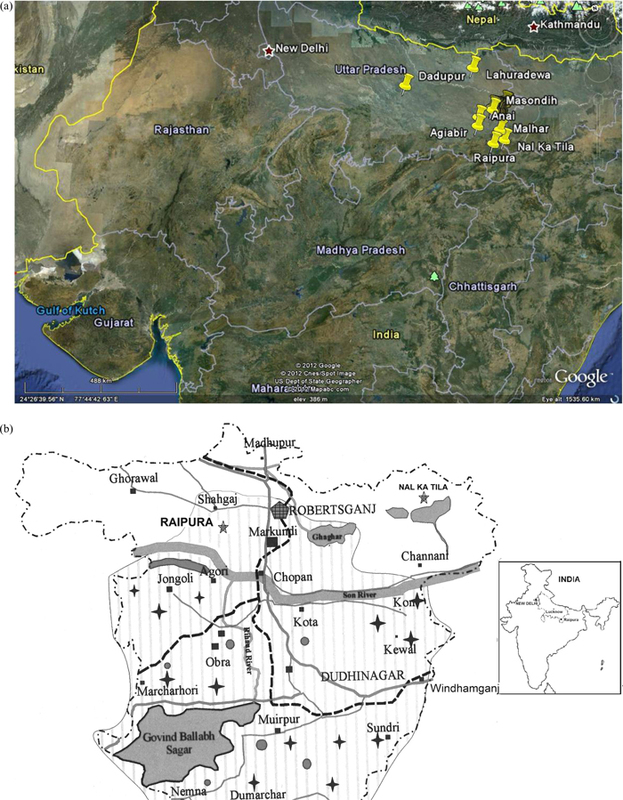 The Vindhya-Kaimur hills in the heartland of India are rich in minerals, including iron ore. Our recent investigations revealed ethno-archaeological evidence of iron working. Excavations conducted at the site of Raipura (Lat. 24°40′40″ N; Longitude 82°58′20″ E) brought to light a workshop of iron smelting and smithy with furnaces, forges, finished iron objects, ore, slag and ingot belonging to different cultural periods datable to a period ranging from 17/1600 to 200 BCE. An iron working community known as Agaria still lives there. They carry the legacy of ancient Indian iron working as they can smelt iron in the age old method. Thus this region has a long history of iron technology spanning over more than 3000 years. The dynamics of iron technology in India has attained new dimensions with recent archaeological investigations. The radiocarbon dates from different sites have pushed back the antiquity of iron in India. The theory of diffusion of iron technology is no longer tenable as 14C dates from excavations at sites in the heartland of India are much earlier than those from bordering countries of the Indo-Pak sub-continent. It suggests an independent beginning of iron in India. Excavations have also yielded iron smelting furnaces and forges providing insight into the ancient Indian iron working. The present paper seeks to highlight recent evidence brought to light by the excavations at Raipura in district Sonbhadra, a site situated in an ore-rich area of the Vindhya Kaimur hills almost in the central part of India. These hills, bordering the middle Ganga plain have been occupied right from the Stone Age. The region yields an uninterrupted history of human culture that suggests that humankind graduated his technical acumen in these parts from the Palaeolithic period through Mesolithic and Neolithic cultural phases to the Age of Iron. The Vindhya-Ganga plain is known for indigenous rice cultivation dating back to 8th –7th millennium BCE and also for an early beginning of iron technology dated by 14C to early centuries of the second millennium BCE. The indigenous iron technology also has a long survival in the region. The ethnic communities like the Agarias and the Asurs, natives of this region had been engaged in traditional iron production for generations. Bloomery iron process of smelting was pursued by these ethnic communities as well as in ancient India. This process produced wrought iron of high purity. The colossal iron structures like the famous Delhi Iron Pillar (5th CE), the beams used in Konark temple (9th CE) or the largest iron pillar of the world now lying broken at Dhar (11th CE) all have been produced by the same technique. Significantly enough there is a marked similarity between the furnaces used by the Agarias and the ones recovered in excavations conducted in this area. An effort has, however been made by us to conduct an ethno-archaeological investigation in the Vindhya-Kaimur hills especially around district Sonbhadra, south of Varanasi during years 2008 to 2012. The present paper proposes to highlight some of the findings of our recent field investigations carried out in the region (Figs. 1(a) and 1(b)). a: Google Earth Image of India showing sites. (Online version in color.) b: Map of Sonbhadra showing the site of Raipura. The Vindhya-Kaimur hills seem to have been resource zone for the cultures flourishing in the adjacent alluvial plain watered by River Ganga and the large network of her tributaries. With rich iron ore deposit, extensive forests capable of providing charcoal used as source of energy and iron smelting sites with high antiquity, this mountainous tract holds the key to understanding the ancient Indian iron technology. Also there appears to have developed a symbiotic relationship between the neighbouring plains and hills over the centuries. Each ecological zone has its own advantages and disadvantages. In recent decades a number of sites like Malhar, Raja Nal Ka Tila, Dadupur1) (Tewari 2010) Aktha,2) (Jayaswal 2009: 141–146), Jhusi3) (Misra et al. 2009) have yielded quite early radiocarbon dates. The site of Raipura which is the subject of discussion here lies in their close proximity. An excavation was conducted at Raipura by us in the year 2010-11. The outcome was particularly encouraging so far as iron working and its dating is concerned. A brief introduction of the site may be in order here. The Site: The site of Raipura (Latitude 24°40′40″ N; longitude 82°58′20″ E) is situated in Ghorawal block, tehsil Robertsganj, district Sonbhadra, Uttar Pradesh, at a distance of 100 km from the city of Varanasi. The mound of Raipura lies about 700 m south-east of Rajpur along the right bank of a water body on the foothills of Vindhya-Kaimur hills in the valley of River Belan which has yielded a large number of Prehistoric sites. The site, surrounded on three sides by a nalla (water channel) coming down the hills has an ideal location for early human occupation. The mound extends over an area of approximately 400 m × 350 m. A depression is clearly noticeable on the surface that is caused by the water channel. This has divided the mound in two parts. The northern part has been labeled Mound-1 and the southern part which is approximately four times larger than the former is designated as Mound-2. We undertook the excavation in this ore-rich area with a view to gaining a real insight into iron smelting-forging. For better insight in the iron working, we also aimed at locating the Agarias, the ethnic iron smelters of this region. The excavation revealed a three-fold cultural sequence mentioned below. It is more or less common cultural sequence at most of the sites in the Vindhya-Kaimur region. Period I is represented by cultural deposit having a maximum thickness of 95 cm. The pottery compares well with Chalcolithic cultural deposits found at sites located in the neighborhood though no metal object was recovered here in excavation. It is characterized by ceramic traditions known as Black Slipped Ware, associated with Red Ware, Black-and-Red Ware and Black Ware. Compared to the succeeding period, the ceramics at this period are much inferior in nature. The clay used in manufacturing of pottery contains impurities. The slip has a tendency to peel off. Most of the pot sherds may be classified as coarse to medium in nature. Handmade, crudely modeled long necked small storage jars are noteworthy during this period. Use of slow wheel is also attested on closer observation of some of the potsherds. The small finds of this period comprised, good number of bone points and arrowheads of very early variety, terracotta bead, stone objects, stone chips, debitage of stone tools and microliths, semi-precious stone beads along with raw material used for bead making. Though no metal could be recovered in excavation from this period, it compares well with Chalcolithic sites of the region. On the basis of radiocarbon dates, cultural remains and relative stratigraphy, the period may be assigned a date bracket of 3200–2200 BCE. Period II (Early Iron Age) was represented by 85 cm thick deposit at its maximum. Iron is introduced during this cultural period. Black Slipped Ware, Red Ware, Black-and-Red Ware and a few specimens of Black Ware are the main ceramics of this period. Grey Ware is conspicuous by its absence. 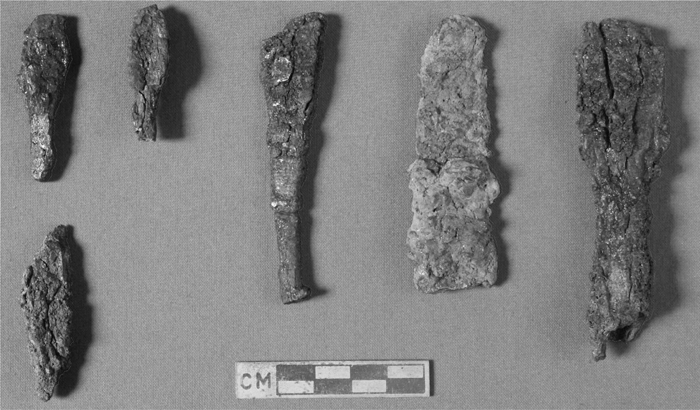 The small finds of this period comprised a number of iron objects (Fig. 2); the accompanying remains are characterized by material like bone points and bone arrowheads, pottery discs, terracotta bead, semi-precious stone beads, microliths. There is a near absence of copper but for an indeterminate copper object. The inhabitants of this period also continued to live in wattle-and-daub houses. Floors and hearths belonging to this period have been traced in different trenches. The most noteworthy discovery of Period II is an iron smelting furnace. It comes in the form of the base of an iron furnace in a fairly well-preserved state. This furnace was recovered from Layer (4) of Trench YI-11 (Fig. 3). The size of the furnace was approximately 55 cm in diameter at base and its extant height that has survived was approximately 15 cm. At the base of the furnace a tuyere hole is clearly visible. The trench yielded a number of iron objects along with iron slag pieces as well as fragments of burnt tuyeres. On the basis of cultural remains which are of an early variety and radiocarbon dates this period may be dated from c. 1700 BCE to 800/700 BCE. Period III was marked by the occurrence of the famous Northern Black Polished Ware (NBPW) which has been associated in Indian Archaeology with advent of urbanization of the Ganga Plain. The deposit has a maximum thickness of 65 cm. The NBPW is designated the deluxe ware of this period. It occurs in a small number at the site. The other wares associated with it continue to be more or less the same as the previous period. Two iron smelting/forging furnaces were unearthed. Stone slabs used to weigh down the bellows were found in situ. Iron objects as well as an iron ingot (Fig. 4) were found from these layers of period III. The design of the ancient furnace is interestingly almost similar to the furnaces used by the ethnic communities till recent decades. It suggests a close similarity between the traditional and the ancient smelting apparatus. We also came across the Agarias who had been actively engaged in iron smelting for generations. A brief narration of ethnographic evidence may be in order here. In course of our field work as stated above, we came across a few elders of Agaria community at village Pipara (24°11′33″: 82°15′23″) or Piparakhand who were capable of producing iron in the age-old method. 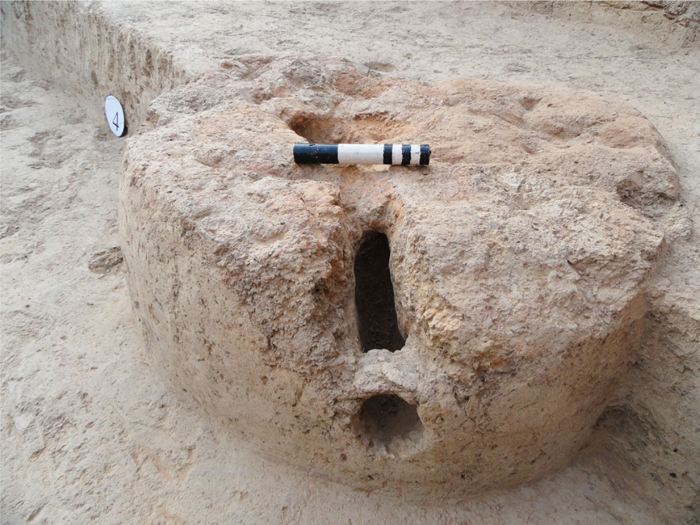 We also observed a close similarity between the size and shape of furnaces recovered in excavations and those which were used by the Agaria iron workers (Fig. 5). Geologically, this village is part of Raniganj formation which is known for low grade iron ore deposits. Looking closely we observed that generally low grade ore scattered on the surface was used by the ethnic communities. But a few iron smelters of Sonbhadra-Sidhi region used high grade hematite ore and also river sand till a few decade back. They produced a superior quality steely iron. With rich ore nodules scattered on the surface mining was hardly required. However, small mining pits measuring up to 10–15 ft. depth or mining shafts could be occasionally located in this belt. As reducing agent, wood charcoal was used by traditional smelters. The wood charcoal could easily generate temperature up to 1200°C that is said to be sufficient for bloomery iron produced by the Agarias. The apparatus in an Agaria workshop is quite simple and look very elementary in nature. 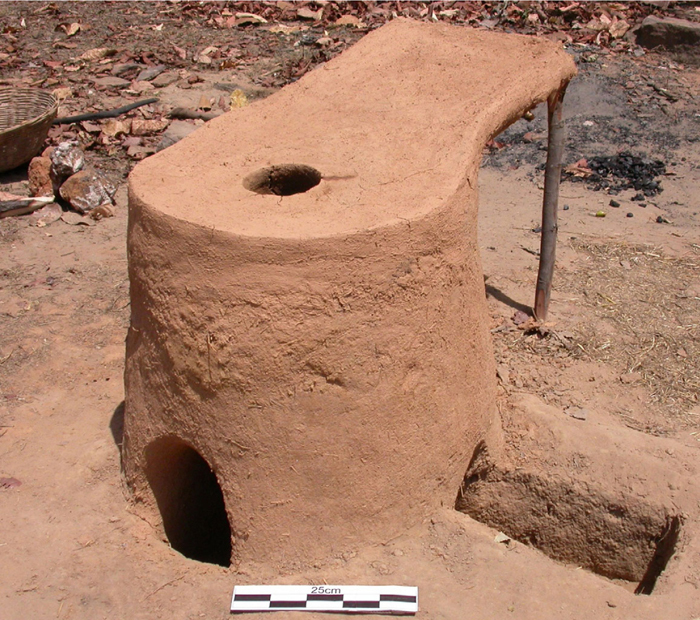 It consists of a simple clay furnace, bellow, tuyeres, charcoal etc. A vertical furnace with tapering sides that is built of common clay has been used for iron smelting (Fig. 5). The height of the furnace used in the smelting operation measures approximately 3 ft. above the ground and 6 to 8 inches under the working surface. The furnace is erected encircling about 6 inches deep underground pit. The clay wall of the furnace encloses a chamber nearly 9 to 12 inches in diameter, running from top to bottom. At the top of the furnace the diameter of the enclosing chamber is observed to be about 6–7 inches. The outer diameters of the furnace at bottom and top are about 26 inches and 14 inches, respectively. The bottom of the furnace chamber opens out on one side of the clay wall. Through this hole a tuyere is inserted and connected to the bellows. On the opposite side at the ground level, a channel (slag-pit) is dug for tapping the slag at regular intervals during the smelting. The air escapes through a 50 cm long hollow bamboo pipe (Bilang) that is connected through the earthen tuyere of 1–1.5 inches diameter, built of common clay mixed with fine straw or husk. The tuyere is about 35–40 cm long. Twin bellows (diameter 27 cm and height 11 cm) made of a circular wooden trough framed with animal hide are used. The furnace is ignited through the tuyere hole that is sealed subsequently. When the furnace starts working full blast, more charcoal mixed with pre-heated crushed ore gets pushed down the furnace through the opening at the top. During the demonstration, the temperature of the furnace at the middle portion has been measured up to 900°C. Generally in one operation one full Dhadhu or Dadu (a basket of about 15–20 kg. capacity) ore gets consumed. The bellows are operated by feet by pressing the twin bellows alternatively. A specific rhythm is maintained. In our study, the first slag was seen to have been removed from the furnace after 40 minutes when the temperature of the middle portion of the furnace measured 635°C. The pace is slow at first and gathers momentum as the smelting peaks. At its maximum pace we have recorded 140 strokes per minute. Towards the end, the pace slows down once again. As observed by us the temperature at the lower part is much higher than that of the upper portion of the furnace. The whole process takes about four hours (depending upon the quality of the charge). After the iron gets reduced, the furnace is allowed to cool. The bottom hole is then opened and the reduced iron bloom is removed through the front opening. The reduced iron in the form of a bloom looks like a spongy mass. Repeated heating and hammering in the forge refines the bloom making it compact. The ingot is shaped in the form of a rectangular piece of metal. The total consumption has been noted to be 10–12 Kg ore, 15–16 Kg. Charcoal ore, 12 kg charcoal and total time taken in the operation was about four hours. At the conclusion of the process an ingot weighing 1.2 Kg. was produced. Iron ore and metallic iron produced by the Agarias of the present times and the one by their ancestors have been studied by us. Also analysed are certain ancient specimens recovered in excavations. Some of the results of analytical study which throw light on status of metallurgy at different stages of its development are being briefly discussed here. An iron ingot procured as a result of demonstration of smelting by the Agarias of Pipra village in Singrauli district was analysed with Image Analyzer. It shows a ferrite network on colonies containing pearlite. Resolved pearlite is also seen in the microstructure. In course of our field work, we have recovered a 60–70 year old iron pickaxe from an Agaria family of a village known as Katauli in district Sonbhadra. That pick axe manufactured by traditional method was also analyzed, courtesy Department of Metallurgical Engineering, IIT of Banaras Hindu University. The iron is slightly reddish in colour. It had a Vicker’s hardness - 125 and Rockwell hardness - 106. The EDAX analysis showed iron content in the matrix of metal to be 99.48%, silicon 0.52% and carbon 0.2%. Further analysis of iron objects from Raipura is under way. However, one thing may be stated that samples indicate knowledge of carburization during the early level of Period III that is assignable at this site from 800/700 to 200 BCE. It may be stated on the basis of the analysis of objects that by 7th–6th century BCE the Vindhya-Ganga region was producing high quality iron that was also used in the nearby sites situated in the plains which must have been the consumer zone. This fact is corroborated by analysis of samples from sites like Anai in district Varanasi4) (Tripathi and Upadhyay 2013). Our SEM and EDAX analysis of iron sample of two objects – one a sickle and another a chisel from the site of Anai excavated by us indicates knowledge of carburization, quenching, and tempering. Evidence of lamination is also attested in the sickle datable to 900 BCE. High carbon (4.19%) has been noted in certain parts of this sample. A series of 14C dates have been procured from the excavations at Raipura (Tables 6 and 7, giving radiocarbon dates). These dates are in conformity with the chronological framework coming forth from other sites of the region like Malhar and Raja Nal ka Tila4,5,6) (Tewari et al. 2004, Tewari and Srivastava 1997: 77–75; 1998: 99–105). Period I at Raipura represents an farming community that used only stone and bone objects having no metal at all. The radiocarbon dates from Period I range between 3270 ± 130 cal BC and 2210 ± 140 cal BC. 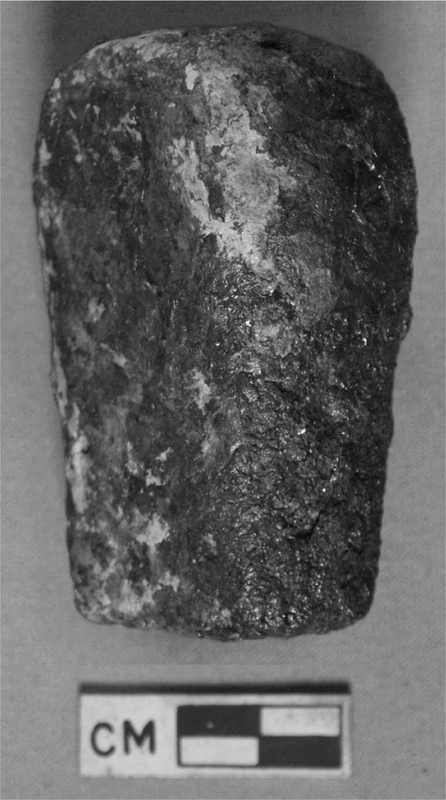 It may be stated further that there is one more layer of about 25–30 cm underneath the spot from where the charcoal sample giving the earliest date mentioned above was collected. The earliest evidence of iron smelting at Raipura comes from Period II. We had picked up charcoal sample from a pit sealed by layer (4), close to the furnace. It has yielded 14C date (BS # 3536) 1720 ± 220 cal BC. There is a deposit of about 20–25 cm underneath this layer. The charcoal sample (PRL 3317) collected from the earliest layer pertaining to Period II from trench ZB-10 yielded a date of 3480 ± 110 BP or 1867 cal BC -1848 cal BC -1774 cal BC -1527 cal BC (1 sigma) or 1932–1438 cal BC (2 sigma). The dates from two independent agencies, i.e. Physical Research Lab, Ahmedabad and Birbal Sahni Institute of Palaeobotany, Lucknow are virtually similar. There is a deposit of about 10–25 cm underneath these layers. Therefore, it may have a still higher antiquity. The early 14C dates attest that iron started at the site in the Pre-NBPW period around 1700/1600 BCE if not earlier. Presence of furnaces, forges, ingots etc. in this ore rich area indicates it to be a production centre. Occurrence of an ingot near the furnace of Period III further adds credence this assumption. The site seems to be supplying iron to the nearby areas in the plains for centuries to come as indicated by smelting activity right up to the strata datable from BCE 1700/1600 to 200 that is Periods II and III at Raipura. Table 6. Table of Radiocarbon Dates of Raipura (BSIP, Lucknow). * For the Sample No. BS#3384, small amount of carbon implied loss of precision. Table 7. Table of Radiocarbon Dates of Raipura (PRL Ahmadabad). [cal BC 1932: cal BC 1438] 1. [cal BC 1395: cal BC 803] 1. [cal BC 926: cal BC 413] 1. Stuiver, M., and Reimer, P. J., 1993, Radiocarbon, 35, 215–230. PJ Reimer, MGL Baillie, E Bard, A Bayliss, JW Beck, PG Blackwell, C Bronk Ramsey, CE Buck, GS Burr, RL Edwards, M Friedrich, PM Grootes, TP Guilderson, I Hajdas, TJ Heaton, AG Hogg, KA Hughen, KF Kaiser, B Kromer, FG McCormac, SW Manning, RW Reimer, DA Richards, JR Southon, S Talamo, CSM Turney, J van der Plicht, CE Weyhenmeyer (2009) Radiocarbon 51: 1111–1150. To sum up, we may say that the excavations at Raipura present unique evidence that is rich in archaeological, archaeo-metallurgical as well as ethnological evidence. Chronologically, it represents an early centre of iron smelting. Trenches of Period I yielded no metal, not even copper. Iron was introduced in Period II though copper was known but only a single object was found indicating its scarcity. Could it be due to the reason that the artisans started experimenting with an alternative metallic ore? The early layers of period II yielded the lower portion of an iron smelting furnace, finished iron objects, slag and refractory materials etc. Significantly enough, the ancient furnace exposed in excavation compares well with the ones survived in the region among the ethnic iron workers till recently. This indicates some kind of continuity in iron production technique in the region for several centuries. The analytical examination of the iron objects recovered from excavations manifests an evolution from wrought iron to high quality steely iron that must have been a consequence of perseverance of iron workers over the millennium. The Sonbhadra region thus has a unique history of iron technology lasting for nearly 3500 years or may be even longer as suggested by radiocarbon dated coming from recent excavations. I am thankful to Indian National Science Academy, New Delhi for the financial support to the project entitled ‘An Ethno-Technological Study of Iron Working Around Sonbhadra Region’ and to the Archaeological Survey of India for granting the license and financial support to conduct excavations at Raipura, district Sonbhadra, Uttar Pradesh. We are thankful to the department of Metallurgical Engineering and Material Science, IIT, BHU for helping us with analysis of iron samples. We also express our thanks to Dr. M. G. Yadav, PRL Ahmadabad and Dr. C. M. Nautiyal, BSIP, Lucknow for dating of the charcoal samples of Raipura. 1) V. Jayaswal: Puratattva, 39 (2009), 141. 2) V. D. Misra, J. N. Pal, M. C. Gupta and P. P. Jaglekar: Excavation at Jhusi (Pratishthanpur): A Fresh Light on the Archaeological Profile of Middle Gangetic Plain, Indian Archaeological Society, New Delhi, (2009). 3) R. Tewari and R. K. Srivastava: Pragadhara, 7 (1997), 77. 4) R. Tewari and R. K. Srivastava: Pragdhara, 8 (1998), 99. 5) R. Tewari, R. K. Srivastava and K. K. Singh: Pragdhara, 14 (2004), 1. 6) R. Tewari: Man Environ., 35 (2010), No. 2, 81. 7) V. Tripathi and P. Upadhyay: A Rural Settlement of Ancient Varanasi (Excavations at Anai), Sharada Publishing House, Delhi, (2013). 8) P. Upadhyay: Bharati, 37, in press.